In a medium bowl, combine all three cheeses and the salt. In another medium bowl pour the pasta sauce and stir to combine. Spray the inside of 4-6 quart slow cooker with cooking spray. Pour half of the uncooked pasta in an even layer on the bottom of the slow cooker. Pour half of the pasta sauce on top. Evenly distribute half of the cheese mixture over the pasta sauce. Repeat the layers again, layering the pasta, pasta sauce, and cheese mixture. Sprinkle the chopped basil on top. Pour 2/3 cup water into the slow cooker and place the lid on top. Cook on high for 2-3 hours or until pasta is tender. * I used one can of regular sauce and one can of Fire Roasted tomato pasta sauce for an extra kick. You can have your pasta dinner and your time too with this slow-cooker ziti that's as easy as it gets! Pasta in a slow cooker? I was just as skeptical as you. I mean, what are the chances that it would cook evenly and not be all soggy? It was one of those busy mornings where my youngest son had stolen my mascara and my other sons had hidden my earrings as pirate treasure. I had just a couple of minutes to think about dinner that night. I knew we had a busy schedule with football games, so dinner needed to be ready as soon or as late as I needed it to be. This Slow Cooker Baked Ziti is as easy as it gets and was an excellent dinner solution to a busy day. It has layers of ziti, pasta sauce, cheese, and basil. Just start by rinsing your ziti in a colander with some water to give it some added moisture while cooking. Then start layering your pasta sauce, cheese mixture, and basil for a pop of color and burst of freshness. I used one can of Muir Glen fire roasted tomato pasta sauce for some added smoky flavor. I was afraid it might add too much spice for my kids, but the flavor was mild enough for them and gave me that deep flavor I was looking for. I was amazed at how good it tasted! It’s also forgiving enough that I could feed my one son before football practice, let it hang out in the slow cooker for a while, and then feed my other son after his football game later that night. This dish is easy and budget friendly. The small list of ingredients is affordable and easy to keep on hand for a go-to meal. 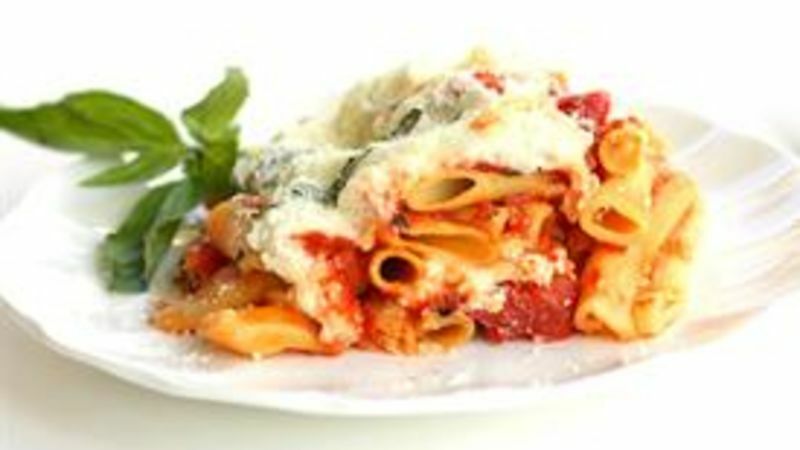 Add some cooked ground beef or sausage to the pasta sauce for a “beefed up” version of this dish. Speak Up: Know a delish dish under $10? Share it!